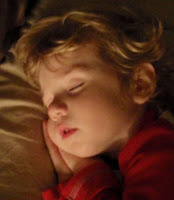 Got Mattias all ready for bed last night – face washed, teeth brushed, pjs on, but he refused to go to bed. He is the KING of STALLING and told me he couldn’t go to bed yet because he had to “do one more thing”. When I asked him what that was he said, “Um, um, I have to draw you a picture and then I have to watch a little bit of TV”. Because it wasn’t quite 8pm, I told him he could do both those things but he could only watch a few minutes of TV. Of course, he picked out the Veggie Tales The Pirates That Don’t Do Anything movie (if you haven’t seen it, I recommend it…it’s cute, and has a good moral to it. Most children’s programming makes you want to bang your head against the wall due to all the repetition but this is tolerable). I explained that he wasn’t going to be able to watch the whole thing, got him settled down and went in my bedroom to get myself ready for bed. A few minutes later he wandered in and said, “Mommy, I yawned. I’m tired. Can I go to bed”? He has never asked me if he could go to bed before. It was so cute. But he yawned, so I guess it was a sign. Anyway, uneventful night led to a good morning. I even found my gold wedding band that had been misplaced (oddly at the bottom of my purse). A few other happy things happened too. Happy Friday! Have a nice weekend! So far, so good!